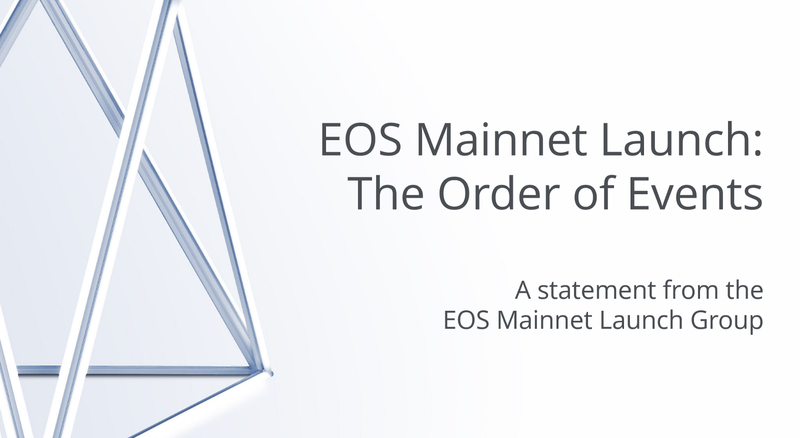 On May 25th, 2018 the EOS Mainnet Launch Group (EMLG) united under the promise of delivering one mainnet which will be called EOS. In an effort to be as transparent to the community as possible we offer our plan for the launch. The ERC-20 EOS token distribution will end on June 1st at 22:59:59 UTC. Per the EOS crowdsale Ethereum smart contract, the ERC-20 tokens will be frozen 23 hours after the end of the token distribution. Once the freeze is completed we will begin the Phases of Launch process. If you have not done so, please be sure to generate your EOS keypair and map them to the ETH address which holds your EOS ERC-20 tokens. The ecosystem will be wrought with scams during this time. Do not import your private key until you have seen a joint statement released from at least five Block Producers that you trust which states when it is safe to do so. Ignoring this warning could result in tokens lost. Please visit https://bp.eosgo.io/ to learn more about block producer candidates. There are no times associated with each phase because ensuring each phase is completed successfully is more important than each being completed quickly. The launch process may take days to complete. Verify Snapshot & Boot: Snapshot taken and verified by EMLG and third parties. Boot process initiated. Testing: Allow time for EMLG and third parties to verify that the tokens have been loaded according to the snapshot file, and that the software performs well. Enable: Release joint statement from Block Producer community that it is safe to import private keys and vote. Voting begins. Activation — Declare the EOS Mainnet active. Only after all 4 phases are complete do we have an irreversible blockchain. Until then rollback and restart of the chain is possible. This essential technical due diligence, including validation testing, could take days to complete. The EMLG will use the official snapshot tool to produce a final snapshot of the frozen ERC-20 EOS tokens. The community is encouraged to use the same tools to produce their own copies of the snapshot and verify that it matches the EMLG’s copy exactly. Once the snapshot has been verified, Appointed Block Producers will be established within the launch group. These Appointed Block Producers are temporary and only exist to ensure that the network is booted correctly and stable throughout the verification and voting process. No block rewards are awarded at this time. Once Appointed Block Producers have completed the boot process and ensured that the token balances are correct the network will be opened for third party verification. Anyone who wishes to verify the network at this stage may do so, and tools will be released by the community to help facilitate this verification. The EMLG will clone the network at this stage and conduct their own in-depth acceptance testing as well. This stage will continue for a 48-hour period to allow for the completion of these tests. If a major bug is found which requires code changes then the 48-hour window will be reset to allow for ample time to test these new changes. The decision to reset the 48-hour window will be at the sole discretion of the EMLG. Transactions or votes staked during this period are not safe and can be undone or lost. At this stage a statement will be released by the EMLG and the network will be opened to the general token-holder community. For an EOSIO chain to be considered enabled, 15% of all tokens stake votes for at least one Block Producer. The length of this phase will be as long as it takes for the token-holder community to act. So get out there and vote! Many block producers have developed tutorials on how to vote. A community voting portal has been developed and you can follow updates on its construction on Twitter @eosportal. As stated above, Do not import your private key until you have seen a joint statement released from at least five Block Producers that you trust which states when it is safe to do so. Once 15% of tokens are staked and used to vote the chain is considered valid and normal functions are activated. All Appointed Block Producers will be immediately replaced by the Elected Block Producers that have been voted in by the community. In the next joint statement we will release the details of the “Verify” period and the tools used to facilitate third party verification of both the software and the token balances. The EOS mainnet is the first step toward a new generation of blockchain technology that will fundamentally affect how we interact with one another. We look forward to sharing this experience with you, the token holder. Thank you for your support. Top 21 Block Producer on the EOS Blockchain. Always adding value. Everything a Block Away.